This morning we spent some time with Apple's new iPad tablet device at the company's press conference and hands-on demonstration at Yerba Buena Center for the Arts Theater in San Francisco. Given the ballyhoo and speculation, there was virtually nothing that Apple could have revealed that would have matched the hype, so it's understandable that there has been some cynicism from observers. Outside of the questions regarding the challenges Apple faces in introducing it's "third pillar" (to borrow a term from Nintendo) it's worth addressing a few questions and observations regarding the device's strengths and weaknesses as a game platform. Truthfully, the game demonstrations at this morning's press conference were arguably the least impressive of any of the products shown. Several groups were invited to test Apple's new software development kit two weeks ago to see what they could do, and both Gameloft and Electronic Arts showed their results. Gameloft had spent some time adapting its online first person shooter N.O.V.A. to the device, while Electronic Arts made some tweaks to Need for Speed: SHIFT, it's fast, tilt-controlled adaptation of the popular console game. Both titles are powered by the Open GL 2.0 graphics engine, so they scaled up nicely to the iPad's larger screen, but they also exposed some aspects of iPad development that studios will have to adapt to quickly. For N.O.V.A., which uses and on-screen d-pad and fire button to simulate a console controller, there were definitely some physical issues to overcome. The iPad is not just a larger iPod Touch...it is actually a slightly different form factor because the screen doesn't sit flush with edge of the device. As you can see in the photographs, there is a black frame around the edge of the screen. For games with on-screen d-pads, you now have to reach over the frame in order to place your thumbs on the screen - which is much more uncomfortable than playing on an iPhone or iPod Touch. Interestingly, the Gameloft team had started putting some thought into new multi-touch controls, including a novel way of targeting multiple enemies at once by drawing a box around targets. Ngmoco founder and CEO Neil Young, who told us that his studio had not participated in the early SDK demos, told us that he doesn't think the altered form factor will be an issue and has already been thinking about how to tackle the change with his own first person shooter, Eliminate. "In Eliminate we have a 'touch anywhere' interface that I think lends itself well to the larger screen," he told us. "Something like that is much more relevant when you have more screen real estate to work with, and I think we'll start to see developers adapting their controls moving forward. This new device essentially has five-finger multi-touch, so there's a lot more we can be doing than just trying to simulate old-fashioned game control conventions." Young speculates that we'll start seeing a move towards virtual control schemes where players can place the on-screen controls wherever they wish as an initial step toward something new, but the real innovation will come later. "For all our claims of being such a creative industry, the games business tends to not really 'invent' anything new very often," he mused. "If you look at what happened with the Wii, for the longest time we were just getting lousy ports of PS2 games, without any real thought for how to interact with the device," he said. "We have an opportunity right now to look at this history and avoid repeating ourselves. The iPad, and of course the iPhone and iPod Touch, give us a great opportunity to think about how we interact with objects. I love that we can make players press things, rather than have them move a pointer onto things. It's much more intuitive." Although some gamers may have zoned out during the demonstration of Apple's iWork suite of productivity software, some of the most significant advances that the iPad brings to the table were visible during an extended look at the Keynote presentation. Apple has tangibly moved things forward with some of the fundamental, system-level gestures and multi-touch functions built into the iPad's OS to make things seem much more natural. There are lots of real-world analogs and abstractions that make interacting with boring on-screen objects seem much more like real life. Files are stacked up like piles of paper, pages are turned, things can be flipped over and manipulated. While they're great for moving files around in a spreadsheet, they also lend themselves beautifully to certain kinds of games. Adventure games and RPGs could be brought to life in very different ways, and 3D object manipulation games like Chillingo's Zen Bound could take on a whole different life. "I'd love to see a real time strategy game on the device," Young said. "In fact, I'm really surprised that EA didn't show something like Command and Conquer instead of Need for Speed, although I understand that they probably needed something running in Open GL 2.0 to scale up nicely. Still, there's some terrific potential for the strategy genre, and particularly for mash-ups of real time strategy games and social web play. "I also really like the MLB demo they showed," Young continued. "The whole idea of a video stream with augmented data has huge possibilities for games. Not just in sports games, but anything where you could take advantage of real time web feeds with overlayed game mechanics." Something that Apple has yet to address is whether iPad apps will be silo'd off as different products from their small-screen counterparts, and Young informed us that this is a concern for developers and publishers too. "In the past we weren't able to bundle OS 3.0 and OS 2.2 applications in the same application," he said. "What we'd really like to be able to do is have full resolution iPad functionality if you run the app on that device, but to be able to also have the smaller-screen version in there too for when you run it on your iPhone. We all have questions about that right now though, so we need to find out what's going on." We asked Young what Ngmoco's strategy was for tackling the iPad moving forward, and he told us that initially the company's focus would be on enhancing existing products, rather than building content specifically for the new device. "We'll be focusing on the smaller form-factor as our primary concern for now, because it has the broadest possible audience," he explained. "It definitely has the competitive advantage because it's already in hundreds of millions of pockets. The iPad will no doubt soon be in millions, or perhaps tens of millions of hands, but the real critical mass will always be the smaller device. "What we'll definitely see though is that studios will experiment a lot on the iPad, and as things start to excel on that device we'll see new ideas finding their way to the iPhone too. We'll see new types of game controls that will permeate backwards, and they will benefit the platform as a whole." Finally, the iPad's lack of support for Flash has come under fire from many observers today. We asked Young if he thought that was a disadvantage. "It's not a problem," he said, emphatically. "The industry is moving towards HTML5 for video and non-interactive content already, and honestly if you want to control your application ecosystem, the last thing you want to do is support Flash. I really don't think it's a problem." In the short term, at least, the lack of Flash support does mean that the iPad won't play any of the most popular Facebook or Pogo games, or casual titles from any of the other popular online games aggregators. If the iPad is going to replace the Netbook or the laptop for a lot of people, it needs to be able to run ubiquitous titles like Farmville as well as it does Need for Speed. Currently it seems unlikely that Apple will support Adobe's plug-in, so the only hope for games like these are native apps that connect back to social networks through services like Facebook Connect. 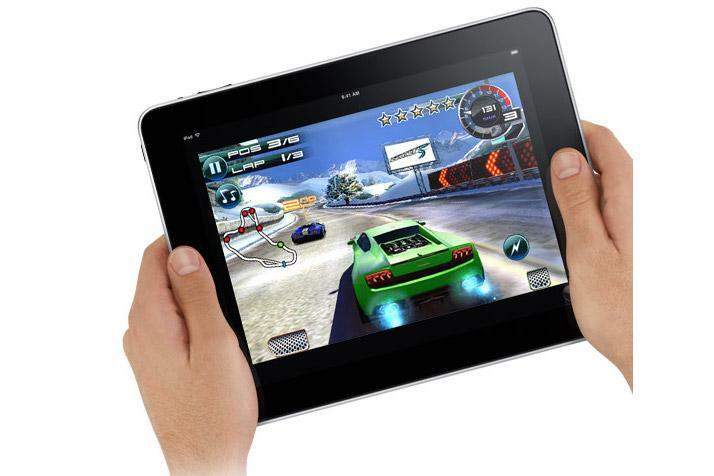 So ultimately, what does the iPad mean for games? While the device is far from being a "games system" it will certainly exert some influence, but honestly in the very short term the simple answer is really "not much." In the longer term however, it could have a dramatic effect on things as developers start to look at new user interfaces and ways of interacting with entertainment content. Multi-touch and gestural controls are here to stay, and if nothing else the iPad, along with its smaller-screened brethren, will continue to assert that.